← From the West Coast of Canada to the State of AZ; to the MESA ISA!! 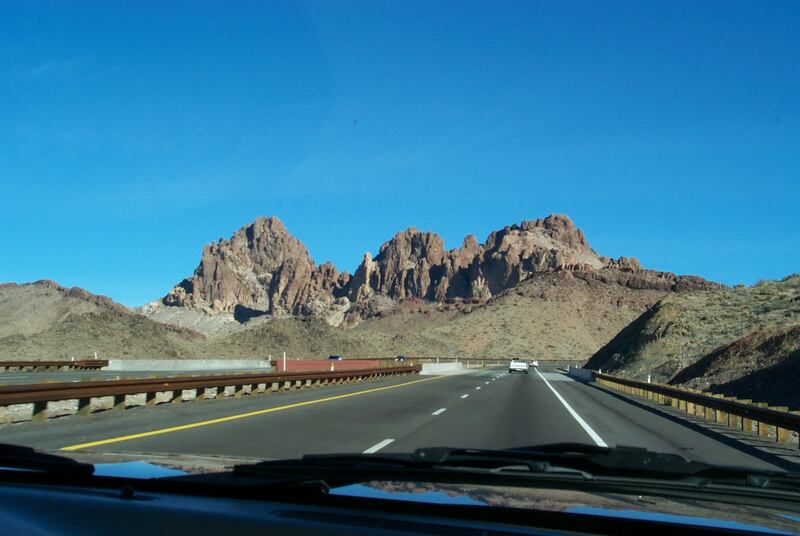 Laughlin NE to Quartzite AZ; pic by Stan. See Windshield Wiper of Truck, base of pic. AZ 14 Ph2 ENROUTE TO MESA ARIZONA DAY 5, PHASE 2. To-day we roughly parallel the mighty Colorado River as it makes its way from Laughlin southward and in so doing provides a convenient border between the states of Arizona and California. It is a “great drive”, wonderful scenery, and sufficient diversions to capture one’s attention. The first such spot is Quartzsite, AZ, a town which has been called “The largest gathering of RVers (recreational vehicles) in the world”. It is the roost of thousands of snowbirds; the galleria of inveterate shoppers, and the mother lode to rock hounds. Shopping is the main activity and they have a saying that if you can’t buy it in Quartzsite in the winter, it isn’t for sale!! The peak of this “heightened activity” is in January and the activity was relatively slow while we were there. The Bureau of Land Management allows RVers to park on vast tracts of land. Except for delivery to your site, when offered, there are “no services”!! However; the price is right ~~ 14 days free at some locations; $25.00 per week at other locations~~where you may dispose of trash and have access to limited water supply. Next Stop: Lake Havasu City/Home of the London Bridge! In 1968, Robert McCulloch of McCulloch Chainsaw bought the bridge in London England for $2.4 million. All 10,276 granite bricks were brought over and the bridge erected across the Colorado River!! The Shops, the streets and yes, the phone booths in the vicinity of the bridge, make one think you may be in London England. See pix in margin; this London Bridge spans the Colorado River!! Yuma is at the base of California and Arizona~~ Just 25 miles from the Mexican Border. Yuma AZ is one of only 2 sites west of the Mississippi river designated by the US congress as a National Heritage Area. The reasons for the designation are of interest to me and hopefully they will be to you. Yuma is strategically situated vis-a-vis crossing the Colorado River. In earlier times this was no small task. Early Native American Indians used the “Yuma Crossing” and it developed into a focal point to all trade routes. The Colorado River, wild and untamed, was at many places 15 miles wide and posed a significant impediment to anyone wishing to cross it. At Yuma the Colorado River narrowed to a mere 400 yards. Granite rock, a unique geological formation for the area, held firm as the river eroded and scoured a deep channel. The combinations of these features assured Yuma’s future as the need for movement from coast to coast developed. The legacy of the Yuma Crossing grew and in 1877 the first railroad bridge was completed, allowing trains to enter AZ for the first time from the west. Soon after came the highway system and in 1915 the Ocean-to-Ocean Bridge was completed, linking San Francisco to New York. While bridging the Colorado had an adverse effect on river traffic, east west commerce was positively impacted. During the dust bowl and the great depression~~1929 to 1935, thousands migrated west hoping for a better life in California, and Yuma was the chosen crossing. Because of the huge migration through Yuma into California, the California State Police posted guards at the Ocean-to-Ocean Bridge. If the migrants did not have money or a commitment for a job, they were not allowed into California. Many were forced to settle in Yuma. Today more than 6.5 million people annually cross the Colorado River at Yuma. ** Facts appearing in this article were taken from an article appearing in the GUIDE TO YUMA. Stan in Yuma, AZ. November of 2003. Re-posted 2019 04 10. Courtesy of Josh, Erik, and Kerry.